For the last 6 months my oldest relish has been stating that she is 2 1/2 with emphasis on the 1/2. She was so adamant that and when I tried to tell her that she was 2 3/4 she cried. I am not kidding. Well, it's time for her to tell everyone she is 3 (for at least one day then she can start saying 3 1/2)! It's crazy thinking back to three years ago when she was so tiny and needed me for every single thing. Now, she is an independent, strong willed child that reminds me of my sister so very much. Not sure if that is a good thing some days, but I always tell people that at least I have 31 years of experience. Ha! 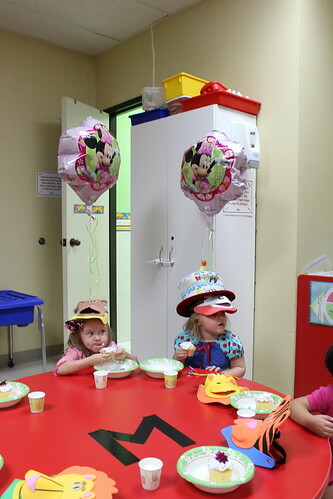 Here she is (Snow White) at her birthday party at school. For her birthday we decided to only give her meaningful gifts and let the relatives spoil her with all the fun store bought gifts. Keeping with tradition, she gets a scrapbook (I use Shutterfly) that highlights her year. I order two, one for me and one for her to treasure (maybe a little too much). My husband also gets her a new charm from James Avery for her charm bracelet, which we got for her first birthday. This year, we decided on a cruise ship charm, because I truly think that was the highlight of her year. She is still asking about the "big boat" and when we are going again. We even have daydreams about getting on the big boat. I tell her to close her eyes and I try to paint a picture for her to imagine. I am terrible at it but she loves it! Now that I made you read all about my sweet girl's birthday, I want to share her third gift from me. Some of you(very few) might remember me sharing about Annabelle's Polish history here, you could imagine how delighted I was to come across this beautiful mermaid paper piecing pattern over at Sewing Under Rainbow for the Big City Girl QAL (hosted by ayliN-Nilya). I was very tempted to participate in the entire QAL that started a few weeks ago, but knew that would stretch me thin. This block alone took three days of my sewing time to complete. It was worth every second! I gave big relish a choice between this or a unicorn pillow. While I wished she picked the easier one, I am glad I made this one because it is just so beautiful! I really practiced my FMQ on this piece. It was my first time doing all of these techniques...pebbles, swirls, and FM stitch in the ditch. It really gave me the confidence to move on to bigger quilts and get out of the meandering slump. I decided to make my mermaid blonde since so is big relish. Most of my fabrics came from my stash or from my new scrap box that I got two weeks ago; otherwise, I wouldn't have had those colors in my stash. It definitely takes the guilt out of cutting up FQs for just a few scrap pieces. I used a flax linen for the border, because I didn't want to pull out any of the colors in the block and wanted it to shine on its own. The border is an Amy Butler print and the back (Out to Sea by Sarah Miller) is an adorable red-headed mermaid. Maybe it will remind her of her mother ;). 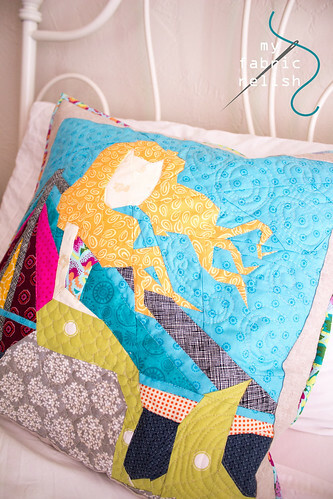 Thanks so much for reading all about big relish turning 3 1/2 and her new mermaid pillow. We are currently at the State Fair of Texas eating our heart out and riding the Ferris Wheel in celebration of big relish's birthday! The pillow is out of this world! Gorgeous!! Thanks, Cynthia! She had a great birthday and loved her new pillow! Thanks, Izzy! I am pretty proud of the FMQing and being brave enough to try a more artistic approach. Thanks for visiting and wishing big relish a happy bday! Thanks, Jessica! And thanks so much for visiting again! Have a great week! Melissaaaaa, Your Warsaw Mermaid is beautiful! Happy Birthday to Sweet Big Relish! Congratulations on your paper piecing promotion! It also took me 3 days to put her together! 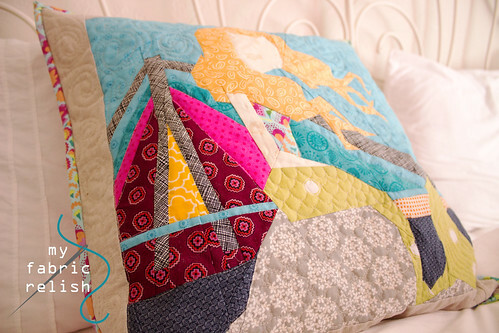 Great quilting and photos! Hi Debbie! Thank you, thank you, thank you! Thanks for wishing big relish happy bday and of course visiting and letting me know! Your pillow is sooo pretty! Absolutely gorgeous pillow! I love the fabric choice for the hair especially. Very nice job! Thanks Amanda! I lucked out with finding the hair fabric in my Fat Quarter Scrap box! Almost all those fabrics came from the box. If Mr. Relish ever questions why I bought the box I will just have to remind him that it made this fabulous pillow. lol Thanks for visiting, girl! ps- hope you made a dent in the laundry after your lil vacation! Thank you, Paula! I'm so glad I took my time quilting. It's so much easier when the quilt is small...lol. And I knew I would find a perfect place for the mermaid fabric. I couldn't resist a red-headed mermaid...haha! Thanks for stopping by! Gorgeous! Simply gorgeous! Oh, and your pillow is awful sweet, too! I remember those days.... Both of my kids were adamant on their fourth birthdays that they did not want to become four. Loved hearing about you telling 'imagine' stories. Very special, too. 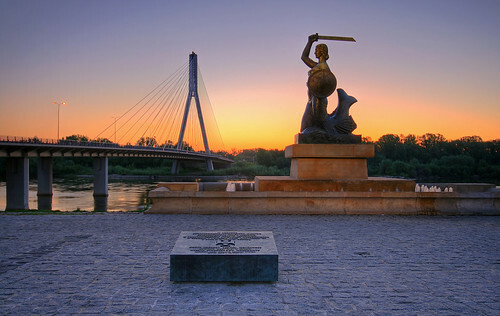 Now seriously, that Warsaw Mermaid is gorgeous. It may have taken you three days, but they were well spent. Your piecing and fabric choices are perfect! My favourite part of the quilting is the scales on the tail. Congratulations on the cushion finish and the Birthday celebration! Thanks so much Lorna! I am so glad I didn't cut any corners on this pillow....just so delighted with it. It might need to sleep with me every now and then. Lol. Thanks for visitng and leaving the sweetest comment ever! Wow! I love it! Great job with the paper piecing. Thanks so much Polly! I am quite pleased with her! Thanks for visiting and commenting...means so much! Thank you so much, Stephanie! I agree, it's always great to make sure there is meaning behind the things we create. I hope big relish treasures this pillow...if not it can live in my room. haha! Thank you! I'm quite partial to the back because I'm a redhead. Thanks so much for visiting and commenting...means so much! oh, what sweet birthday gifts. 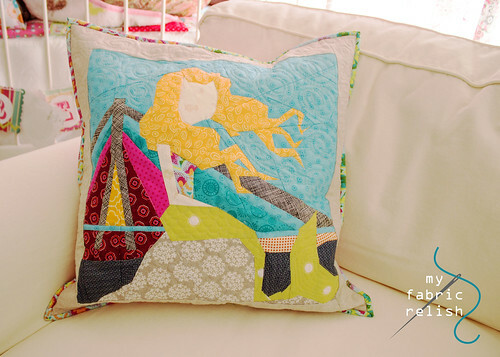 Love the mermaid pillow, and your FMQ looks great on it! Thanks so much Kelly! I am pretty happy with the FMQing. Decided that I should try some techniques out since the recipient was only 3. No judging!! Lol. Thanks for having me! my goodness, it is darling! great job on the fmq. all those mermaid scales look fabulous!! I like your idea of meaningful gifts only. good choice. your new banner looks nice, too. are those hexies epp? i'm going to have an epp link party next weekend. but first I need to get my computer to cooperate with blogger - it's not letting me edit or post anything new - yikes! Thank you!! We feel like we are surrounded by toys here and are blessed with lots of grandparents and aunts that love to spoil. They will probably think we are lame until they are older. Haha! Thanks for visiting again and the sweet comment! I love the pillow. 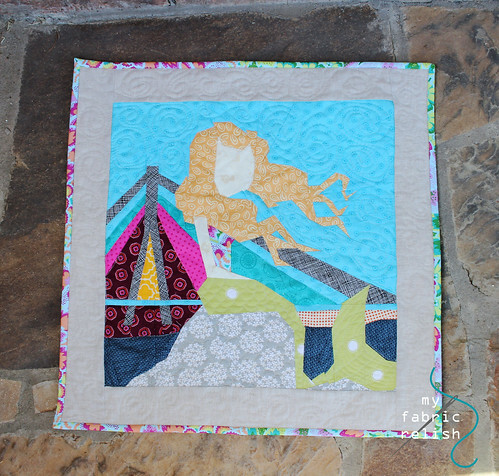 The details on the mermaid and the quilting is all darling. Thank you so much! I'm glad I tried some of these FMQing techniques out. Maybe I'll have enough confidence for a bigger size. Thanks again for visiting!!!! Aww, thank you! I'm still shocked she shared this for free! So generous!! 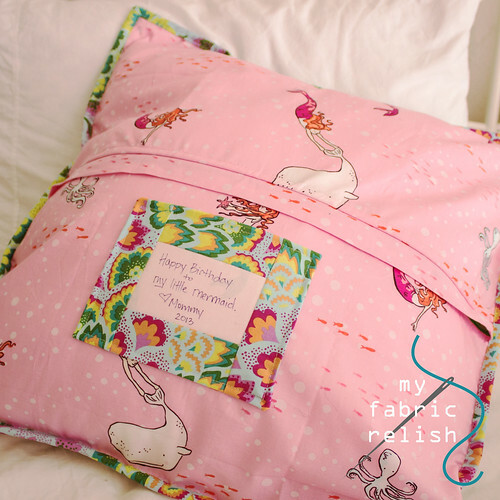 Your pillow turned out so beautifully! I bet your daughter was thrilled with it! I love the traditions you have for the birthday presents - really sweet and special! Thanks, Kristy! Yes, she loved it! I hope they appreciate these treasures when they get older...lol. Thanks so much for the visit and follow!!! Free Birthday Gifts! Bdayo.Com was created with one goal in mind to help our users enjoy, celebrate, and remember their birthday! Bdayo allows you to find unlimited amount of Birthday Freebies in your area and offer unique features to help you learn more about that special day!